Art Smith's "Half & Half." What is jewelry? We know what it is, of course. Jewelry is the pretty extras with which we adorn ourselves. But what is it really? There is no specific use to jewelry. Yet, humans in every culture on the planet wear jewelry of some kind. It is ubiquitous and pointless at the same time. A piece of jewelry is in a sense an object that is not complete in itself. Jewelry is a ‘what is it?’ until you relate it to the body. The body is a component in design just as air and space are. Like line, form, and color, the body is a material to work with. It is one of the basic inspirations in creating form. Kids Wear the Darndest Things! 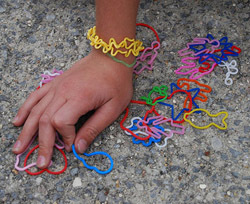 Trying to understand why kids are in love with what amounts to a rubber band.